Add your sliced onions to a large bowl and cover with buttermilk and let sit for about 30 minutes. Heat oil to 350 (we use the deep fryer). In large bowl whisk together flour, paprika, pepper, salt and garlic powder. In small batches remove onions from buttermilk and toss in flour mixture and then into deep fryer and toss a few times until browned, drain on paper towel and repeat, set aside. add all ingredients into a bowl and whisk until combined, set aside. In large skillet add your ground beef and onions and saute over medium-high heat until browned, drain off fat. Add in remaining ingredients and simmer for 20 minutes. Add your canned cheese sauce to bowl and heat up slightly in microwave. Toast your Texas toast and layer one slice on plate. 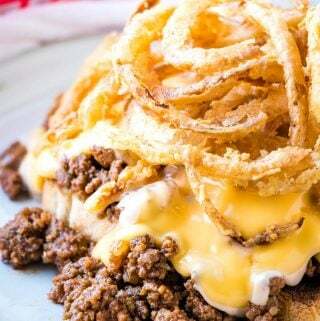 Top with sloppy Joe meat and then spread desired amount of burger sauce over the top, then desired amount of cheese sauce. Top with onions straws and serve.